Whilst English and American pool look very similar to play on the surface level, the two games are actually very different. Differences are everywhere; from the size of the balls, the types of cue used, the size of the pockets, the size of the tables and much more. 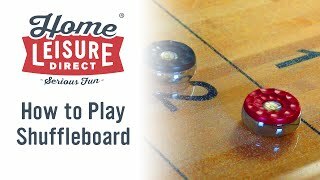 In this video, we'll dissect both games to show just what makes these two styles of cue sport so different. "Okay, so one of the most common questions we get is, what is the difference between English or British pool, and American pool? And that actually there are whole load of differences between the two types of game. And many people don't realize sometimes what type of table they've been playing on. They may have been playing the same pub for years, and don't know that they've actually been playing English pool for example, or they might have been playing in a pool hall for years, and not realize that it's American pool they have been playing. 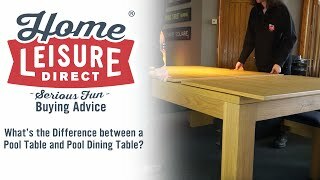 So in this video I'm going to take you through all the differences in some detail, and at the end of the video, I'll give you a summary to help you choose what will be the best table for you to buy. 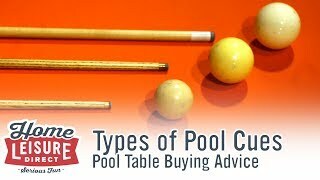 Okay, so let's start off with the difference between the two types of ball that you use between English and American pool. So, American first of all, these use two-and-a-quarter inch size balls, and that's both in the cue ball and in the object ball. And these weigh 169 grams. For English pool, we've got the cue ball, which is at 1 7/8th of an inch in size, and weighs 96 grams, and you've got the object ball which is 2 inch in size, and weighs 118 grams. Now you may well be wondering, what is the difference...why is there a difference in size between these two? So in English pool, most often is played in pubs, in coin operated tables. And the table actually senses as the cue ball goes through the mechanism, that it is smaller than the object ball, and it divides the two. So this will go to the return bulk end the table if you've say done a foul shot, and obviously the object ball when you pot it, it will then run into the window so can you see which balls you've potted. And that's the reason that these two size balls are different. And in tournaments they use these size balls as well. So even if it's not on a coin-operated table, still in tournaments it will be one and seven-eighths of an inch, and two inch size object balls. So if we compare these two cue balls, this is what makes the big difference when you're playing the game, is that at 96 grams, this is only 57% of the weight of the 2 1/4 inch cue ball played in American pool. And that's why different types of cue are used when you're playing, or when you strike the ball it feels so different because this is so much heavier than the cue ball. 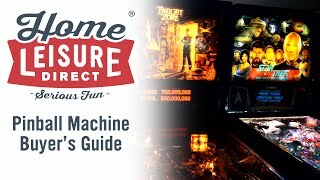 And that's why it's important that when you're choosing what type of table you want to buy, that you know the differences between the two, because playing the two games does actually feel quite different. Okay. 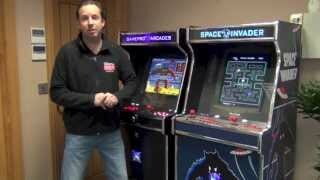 So next step on then from the size of the balls, is to look at the size of the pockets. And obviously on an American table the pockets are going to be a lot larger than they are on an English table. So if we look at the two American balls here, the size of the pocket is actually dictated by the size of two balls side by side. You put them into the jaws of the pocket there, and you can see that the two balls fit in there perfectly. The other thing to look at also is the cut of the cushion, and the pocket jaws. It goes along straight, and then it cuts straight into the pocket, and the jaws of the pocket are actually slightly angled. So when you're potting a ball along the cushion rail, it hits on the inside there and causes the ball to be potted into the pocket here. If you compare then what the American ball look like in the pocket, to an English ball, you can see the difference again that I was saying about earlier on in the size of the balls, the English ball inside the pocket does look absolutely tiny. And that's why you can clearly never play with English balls on an American size table. Okay, so now we're looking at an English table. So again for the sake of comparison between the two different size of balls, there's two American balls, but let's first of all look at the two smaller English balls, and put them into the jaws of the pocket again so you can see how they enter. And again, the pocket size is roughly the size of two balls side by side. They don't actually go into the jaws of the pocket quite as far as they do on an American table. There's actually still quite a lip left on the journey into the pocket. But you can see there the comparative size of the pockets, to the size of the balls. The other thing to look at is the shape of the entrance, the jaws of the pockets. They're actually curved on an English pool table. Very similar to a snooker table in fact. Whereas on the American table, they were cut straight on the entrance. And that makes quite a difference when you're trying to pot a ball along a cushion. As you play there, you've got to be pretty accurate. If you hit it right, then it will hit on here and it will go into the pocket. If you're not quite spot on, it will cause the ball to rattle and it will come back out. 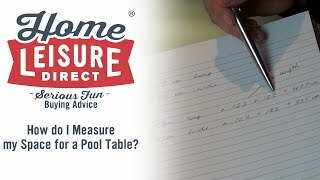 So you need to be more accurate when you're potting on an English size table. Just again for the sake of comparison is look at the size of American balls, if you were to put them on here, you can see how different they are, and how large they are, compared to the pocket on an English table. Okay, so let's now have a look at the way that the cushions are cut, and how they differ between the two types of table. First we look at an American table. You'll see that the way that the cushion has a tip that the ball strikes against. 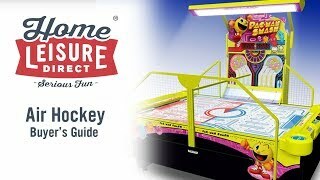 It then disappears away, so you've then got the top of the cushion here, and it then falls away at an angle, so the ball is literally hitting the tip of the cushion here. The pockets are cut differently between an American table and an English table. 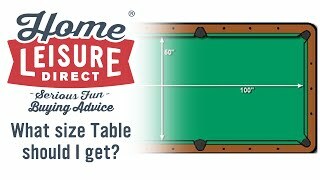 In an American table, the center pocket, because it's cut at an angle here, you've actually got quite sharp corners. Which means that when you're potting from this type of angle here, your actual target are is very narrow because you've got this tip which is protruding. As you're trying to hit that shot, it can be quite tough to pot into the center. What if you're potting straight though? It is dead easy. The pocket is as wide as we look at with the corners, where the pocket is actually a double-ball width in terms of size. So you'll find quite often American pool players will not take a shot into the center, they'll take a shot into the corner pocket, because the shot along the rail is a lot easier. Because of the way that the pockets are cut, you can shoot the ball along the rail here. And even if you hit the cushion along the way, it will still hit the interior there of the pocket jaws, and it will still fall into the pocket when you pot the ball. Okay, so looking at an English table then, you'll see that the edge of the cushion here is actually got a flat front to it, and then the rubber actually goes in. And you can see where I push the cloth is actually hollow on the inside there, whereas on the American table it was solid as the cloth went down the face of the cushion. So the other difference then as you look at the center pockets on here, these are actually round rows on the American table. They were cut virtually square. Now that means that potting into the center pocket is a lot easier. So if you've got a tight angle still here, you can still see clearly into that pocket. It's a much easier pot into the center pocket on an English table. But going down the rails conversely is tougher. Again because they're cut where they've got the circular shape, you've got to get the ball very tight as you're going down the cushion rail here. If you're slightly off, if you catch this first knuckle, it's very light a bubble, and come back out again. So you're going to need to be far more accurate when you're playing on an English table. And as I mentioned before, that's because of the similarity between an English pool table and a snooker table, with their curved pocket openings both in the center and in the corners. Okay, so now let's look at the difference in the sizes of table. And first we'll consider American table. So at tournament size American table is nine foot in size, whereas an English table is only seven foot in size. So there's quite a difference between the two tournament sizes. I actually stood here with an Etrusco P40. This is an eight foot size American table, and this tends to be the most popular size that we sell to U.K. home customers, because it's easy to fit into a normal size room in an English home. A nine foot table can be a little bit on the large side. We do also sell an awful lot of seven foot size American tables, and that's because again they fit more easily into a U.K. home. 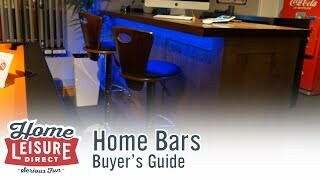 But also in the States, bars will use seven foot size American tables. And you may well find if you play an American pool in the U.K., say in a bowling alley, a lot of the time they will use seven foot size tables there. A seven foot size table is easier to play on. Purely because the size of the balls and same size of the pockets stays the same but obviously it's a smaller size, it does make it easier to pot the balls on a seven foot size table verses and nine foot sized table. Okay, so let's look at an English size table. This is a seven foot sizing, this table. This is actually one of our luxury models, it's a Montfort Lewis, it's a pool dining table. And the seven foot size is often considered as the standard size, the normal size of an English pool table. And the reason for that is because that's the size that's used in tournaments. In tournaments that's right the way from being local pool leagues, they could be county level, or could be held in your local city, all the way up to the world championships. They always use a seven foot sized table. The only exception to that is some of the televised events in the world championships. For example, they'll using an eight foot table for the final, and that's because it's been filmed, and a large a table looks better when filmed on the TV cameras. In pubs, as I said, they'll generally have a seven foot size table if it's been played on by a local pool leagues, but if they're not, they'll have a six foot size table sometimes just to use less space, if they haven't got enough room for a seven foot size table to allow free cueing all around it, they'll choose a six foot model. 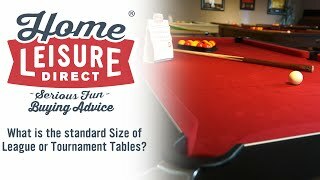 So home customers will often decide to choose a seven foot size table, because that's what they consider as being the standard size that's used in tournaments. But if you don't have enough space, don't squeeze a seven foot table into your room. Go for six foot table, you'll get a great game from that. As I said, a lot of pubs people will be playing on a six foot table and not realize the difference in size between a six foot and a seven foot. 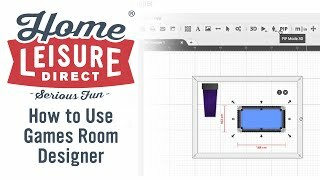 Watch out on the video, and that will give you guidance on how to measure your room, and make sure that your table will fit in there, and allow you enough space to be able to queue around it freely. 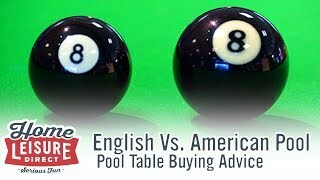 Okay, so by now you're probably finding that there are actually a lot more differences between English and American Pool than you thought. And we are going to move on to the cloth now. And again, that's a very different type of product that's used on the two different types of tables. So first all let's talk about American. American cloth is...this is actually a Simonis cloth that's on this particular Diamond table. This is...98% of tournament tables will use a Simonis cloth on there. And the difference really is that there's no nap to the cloth. So an English cloth will have a furry, fuzzy surface to it. An American cloth, you can literally see the weave. So there's no fuzziness to it. And that means that an American cloth will play faster. But one of the characteristics you'll find of an American cloth is that when the ball is struck, it goes from 0 to 60 at a very, very fast rate. 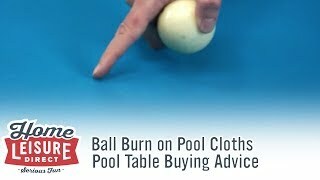 And that will generate heat in the ball, in the cue ball that you're hitting, and that will cause a very small little burn mark, it's actually a burn mark on the surface of the cloth. And it just goes a little bit lighter. And you can see from this close-up, where the ball's been struck, where we cue off from on this particular table, you can see that the cloth is a little bit lighter there. And you'll find that over time, the entirety of your pool table surface will have these small little circular burn marks, where the cue ball is being struck. On an English style table, English style woolen cloth, which has got this mat surface to it, first of all you find that as you go down the table from where you break, it's got a smooth surface. You can go down the grain of the cloth and you feel that it's smooth, you go against the grain, you can feel that it's got a rougher type of feel to it. And because it's got this fuzziness, the surface, it does play slower. The ball will move along it slower, the ball will come to a rest faster than it will do on an American style table. But because of this fuzziness to the surface, you won't find so often the characteristic ball burn marks that you'll get on an American table. Is far less prevalent on there. And the other thing to note about this, is very similar, it's the same style cloth that you use on a snooker table. So if you played snooker, you'll find that English pool cloth will be the same woolen mat surface, with that directional grain going down the table. So one thing to bear in mind is that on American tables, customers will always choose an American style cloth because that's the right type of cloth to go on that table. So, to stick with American...if you're going to buy an American table, pick an American cloth. 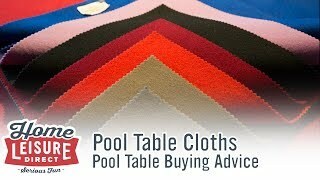 But for English pool tables, some customers will prefer actually to choose American style cloth to go on there. And that's one of two reasons. So firstly is because it plays faster. So if you're buying a brand new English table, because the cloth hasn't been played on before, like it would have been in a pub table, it will actually be quite slow to start off with. And as you've been playing on it through the years, it will speed up as the cloth wears in. But a lot of customers will prefer to have a faster table straightaway, so they may well choose to have an American style cloth on there. The second reason is because they prefer the colors that are available maybe in American cloth that aren't in English. On this particular table, this again is one of our Montfort Lewis luxury tables, this is an English table, you can tell by the cuts of the pockets there, they've got this curved shape to them. So it's an English table. They've actually got an American Simonis cloth fitted to it in this purple color. And that's because we really like this purple color. It's quite lilacy. Whereas the equivalent English style cloth is actually quite a dark purple. You can sort of see the difference in the colors between the two. This lilac one I think looks really great with the black, whereas this one is a little bit dark. So you may well prefer to choose an American style cloth to go on your table, just because the colors suit what you're looking for more closely. So next we'll have a look at the cues that you're going to use, depending upon whether you're going for English or American pool. So first of all let's have a look at the English cues that you'll use. So this is traditionally made out of ash, and it's got a 11 mill fit tip, but maybe down as low as 8 1/2 or 9 millimeters. 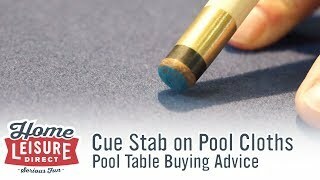 That's what professional players use, a very thin tip on their cue. This is about 11 millimeters in size. And that's obviously corresponding size to the size of the cue ball. On an American cue, they're actually made out of maple. You can see this is a lighter wood with a less prominent grain. I thicker tip, 13 mil thick on the tip. And again that's because of the size of the cue ball that you're striking. You also notice that on the English cue we use a brass ferrule. This piece of brass here is actually called a ferrule. Whereas on the American cue, they use a plastic ferrule, and it's a lot longer. And the reason for that is because of the weight of the ball, when you're striking it really hard, it does actually slightly cushion the blow against the ball, and gives you more control over the ball as you strike it. So that's the difference between the two types of cues that you'll use when playing either type of game. Okay, so let's have a look at the game you're actually going to play on either your American table or your English table. So first of all let's look at English. So you've probably seen this in the pubs where you're playing with a set of reds and yellows, and the object of the game is one player is reds, one player is yellows, pot all those colored balls, and then you've got to try pot the black eight ball as the last one. Whoever does that wins the frame. You can do the same thing with American Pool. So this is the same sort of rack. Again its eight-ball, but you're using spots and stripes balls. If you buy an English pool table you prefer the look of spots and stripes, you can buy spots and stripes and still play eight-ball pool on there. But obviously on an American table, they don't come with reds and yellows, it's always going to be spots and stripes on there. The reason for that is you can play either eight-ball pool or nine-ball. Now nine-ball you may well have seen on the TV, has had loads of coverage over the last few years on SKY, specifically with the Mosconi Cup, and with the World Cup of Pool. And they are always playing nine-ball. So nine-ball is played where both players are shooting for the same ball. So after you've broken, you're basically trying to run the ball through from one, two, three, in numerical order, up until whoever can pot the nine ball at the end. So it is potential...there is potential that one player could pot one, two, three all the way up to number eight, misses the nine ball and then his opponent has been sat there watching for the duration the frame stands up, and he pots the nine ball, and he takes the frame. 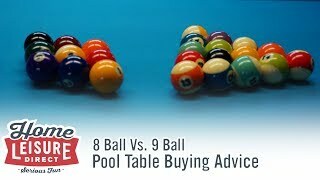 So it's quite a different game between playing nine-ball and eight-ball, and it's really worth trying to play both, see which game you prefer and practice with your friends. There's also...in America there's number of tournaments played, other varieties of games, again using the same ball. So you've also got 10 ball, you've got straight pool which is also known as 14.1, and you've got one pocket. So there's tournaments for all those over in the States. If you've been to the USA, you may...would have seen those. We won't cover off the rules for those in this video, but watch out for other videos, and I'll take you through what the rules are for those, so you can give those a try as well. 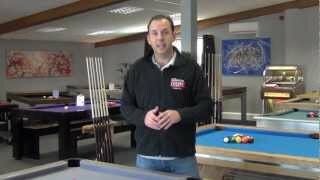 Okay, so I've taken you through quite a lot of information on English pool tables versus American pool tables. But I wanted to try and bring a bit of a summary at the end. 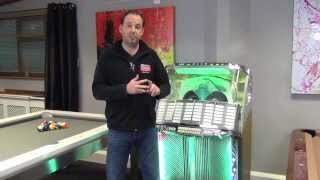 So why would you buy an English pool table? Well, a lot of people have grown up playing on the pubs...tables in the pubs in Great Britain. So they're used to playing on a six or seven foot table with two inch size balls, and that's just what they're used to. So having played on that, that's what they want to have in their own home. It is a tougher game. 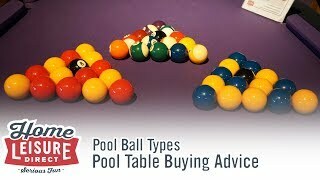 So if you're after something which is a little bit more taxing, and you're going to need to really hone your skills to be proficient at it, then English pool can be a bit tougher than playing American pool. Next reason really is a lot of people want to be able to practice at home. So if they going...playing in local pool leagues or competitions, they want to be able to practice at home and get better at it. Therefore if they're playing English pool out about, they want to be able to play English pool at home. But a lot of people are just playing against their mates in the pub, and therefore they want to practice at home and get better, and then take their A game into the pub to beat their mates. And the final reason could well be down to price. So English pool tables are generally cheaper than American pool tables. They start from just under £700. 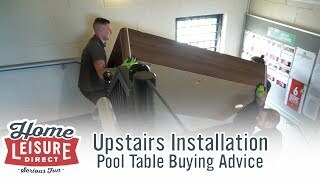 So it's a bit more affordable to get into English pool and still buy a really good standard of table. At £700 or so, you're buying a slate bed pool table that's of a competition grade. 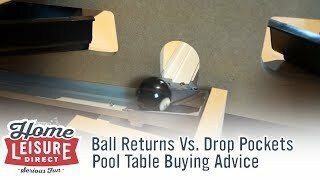 So you can get a really good gain at home from an English pool table. Okay, so why would you choose an American pool table? Well, a lot of our customers have either played American pool in their local pool hall. That's where they go to play, that's what they're used to playing. But also people that have traveled a lot abroad or have been living abroad, would have only really ever been playing American pool because pretty much everywhere else globally is playing American pool, not the smaller two inch English style pool. So that's the game that they're used to. It is a faster game and it's easier to play. 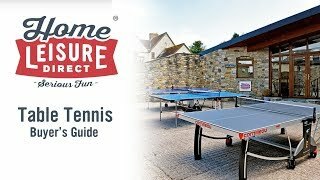 So if you've got family members that you want to get involved, younger players, because the balls are larger, the cues are more robust because they're bigger and got a thicker tip on there, it can be easier for younger players to play, and a faster game and easier for them to master. Also if they're playing in competitions, again, like we were saying, for English pool, if what you're going to be playing at your local pool hall is going to be American pool, then get an American table at home. That's what you can practice on, and then you take your game back to play your mates, and that's what you're experienced at playing. The last thing really is because American pool tables do look cool. 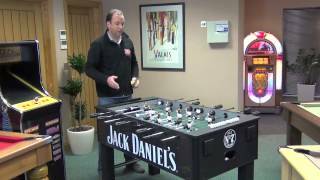 If people want to make a statement, they want to do high end games room or for a commercial locations, so hotels, pool halls and that sort of thing, we got a lot of customers that just want an American table because it's larger, the balls are bigger, they look great. 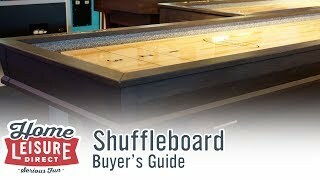 Or they want to get one of the top brand tables, the top brands like Brunswick. 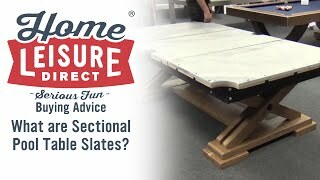 So you can see a Brunswick table here and here. Then that as a brand, Brunswick only make American pool tables. It's an American brand, they've been around for over 150 years, people know the name Brunswick, and that's what they want. Or Diamond, the table we've been doing a lot of shots on earlier, they're always American tables. That's what used in 98% of the televised pool competitions now are all Diamond, and Diamond tables only come in America pool. And bear in mind obviously Diamond and Brunswick are exclusive to Home Leisure Direct. So you can't buy those tables anywhere else. We are their exclusive company that represents them in the U.K.
Hopefully that has been of help to you. There actually quite a lot to take in. 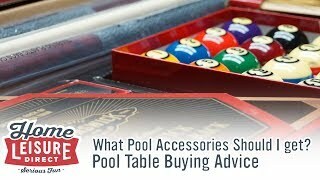 Maybe you didn't realize that there were so many differences between English and American pool tables. If you're still uncertain...I wouldn't blame you if you are uncertain and you want to come down and try out some of our tables here. We've got loads of American, loads of English pool tables. Come and have a game. If you're buying it for your family, bring them all down as well, get everybody involved and see what suits you guys best. If it's a bit too far for you to travel or not convenient, then by all means go to your local pool hall. Most pool halls nowadays have got English and American tables in there. Rent one of each of the tables, have a game there, get a bit of a feeling. And if you still need some more advice, then give us a call, we can talk you through everything, what you need to know on the phone."